The KJGSC Under 12 Joeys played in Sundays catch up round against the Brunswick Zebras FC. 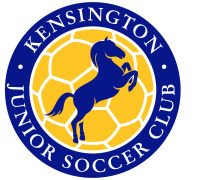 The end result was convincing four goals to two victory for Kensington. Kensington dominated the match and were comfortably cruising to victory leading 4 goals to nil with 5 minutes to play. The final score line actually flattered the opposition as their two consolation goals came extremely late in the match. As coach I was extremely impressed with the girls improvement, with them actually implementing the basics we were practising at training. For the parents I have a philosophy of teaching the girls to be confident on the ball. When the ball is in their area of influence to either go and get it or stop it, take control and run with it or pass the ball to a team mate. From Sundays game I hoped you all noticed that they were able to follow these instructions and that the team is improving as a whole. It is brilliant to watch the girls actually begin to play soccer and not just booting the ball away when it comes towards them. The game was a total team effort, the ball was being shared around with some precise passing and this in turn we saw the goals shared around. The goals were scored by Delali, Hollie, Jade and Isabella E. Two other notable efforts were close to hitting the back of the net. We saw Alicia power a shot which was expertly saved by their keeper and also Delali had a shot which thundered against the post. In addition there were countless other shots that were close. Again I am extremely proud of the girls efforts. As always keep on fighting, chasing, helping your teammates and trying. This week at training I will focussing on explaining the offside rule, practising on how set up for goals kicks both for and against and once again talk to the girls that it does not matter if they make mistakes on the field. I saw a number of girls extremely down on themselves after we coped the two late goals. Girls, it is ok to make mistakes as long as you learn from them.